With a special plastic strap to ensure a tight but comfortable fit, the Honeywell Chainextra Butchers Glove with Plastic Strap 254200XR0302 provides exceptional cut resistance ideal for working in butchery, the kitchen and with food. 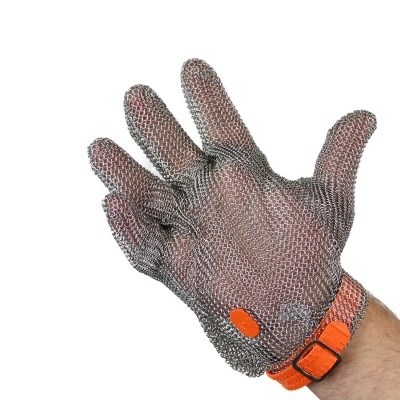 The glove is fitted with a 100% stainless steel chainmesh, that allows the user to work in high risk environments without worry of injury. The Chainexpert Butchers Glove is available in one size that should suit most users. This is because the glove is fitted with a plastic strap that allows the user to adjust the tightness of the glove. It is still recommended that you measure the total length of your hand and match up to the table below to ensure a safe and secure fit. Please note that the Chainextra Glove should be scrubbed vigorously at least once a day with hot soapy water or in a mixture of hot water and detergent.